The Valdichiana is the ideal location to stay if you visit Tuscany, Umbria or the central Italy in general, this area of Tuscany is endowed with road and railway connection to rest of Italy. At the same time is ideal place to live a relaxing holiday in contact with nature for example enjoying a walking or a biking day on the Sentiero della Bonifica. The Sentiero della Bonifica is a cycling and pedestrian path of approx. 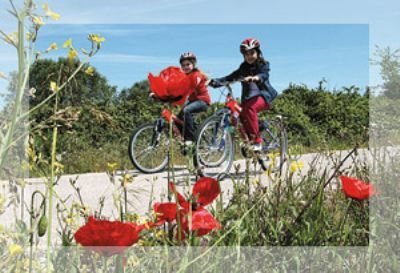 60 km connecting the city of Arezzo and Chiusi, and has been realized on the edge of the Canale Maestro della Chiana, creating a natural track without any height or level differences which makes it suitable for sportive but also for families with children. The Canale Maestro della Chiana is an historical hydraulic engineering achievement which even nowadays, plays an important role in this area. The land reclamation and the realization of the ‘Canale Maestro’, across reclaimed areas, changed the direction of the water which now flows northwards to flow into the Arno river. The result after this area being marshland for centuries, is nowadays one of the most fertile Italian valleys rich of wine yards, olive groves, orchard and farms. As a consequence, you can cycle along a truly ‘noble’ pathway, shaped by man and by mother nature, working together in total harmony. A different concept of time is this cycle path’s essential factor, in the sense that the joy of going slowly is rediscovered and in the sense of travelling back through time to the distant and enigmatic past of the Etruscan civilization. The path it’s not presenting difficulties and following the course of the river run in the plains. While it is not necessary to recommend a specific workout a certain habit to ride if you intend to follow it in all its length, or you plan on doing small deviations for visiting the major towns of the ValdiChiana. You can enjoy a vacation rental in the Valdichiana in a villa with pool or a in farmhouse situated close by the Sentiero della bonifica.